Schubert covered all bases when it came to chamber music, so it is no surprise that he left good number of works for violin and piano. Most of them aren't particularly famous though, and he never seemed quite as comfortable with the violin as he did with the piano as a solo instrument. As these three works show, he struggled to find a specific identity for the violin, veering between the folk fiddle, the orchestral soloist and the café band leader. One consequence is that, while the solo lines are always melodic, they rarely show off the violin at its best. Carolin Widmann's tone here often sounds course and constricted. But when compared with most other versions on the market, it is clear that she is being as lyrical and sweet-toned as the music will allow. In fact, her performances here are very impressive, always impassioned but always tasteful too. She seems most at home with the louder music, which she projects with a muscular tone. She takes the dynamics right down for the quieter music, but is never tempted to dwell on the more nostalgic and sentimental passages. Pianist Alexander Lonquich never plays like an accompanist, and the drama and atmosphere that make his solo recital discs so special are much in evidence in his playing. The A Major Sonata often goes by the name 'Grand Duo'. That title isn't given here, but it's exactly how it is played, and the whole disc finds the two players performing as equal partners. 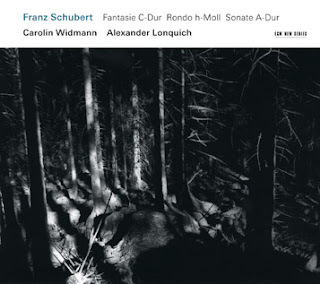 Lonquich is particularly impressive in the repetitive accompanying textures, which he is always able to make musical, yet which never threaten to overwhelm the violin. The fact that the two players can maintain their individuality and soloistic credibility throughout is impressive enough, but it is equally remarkable that the performances never descend into rivalry. True enough, the piano does occasionally take the limelight in a way that Schubert would probably have disapproved of, but it is usually through Lonquich's more overt phrasing and articulation rather than just louder dynamics. The engineering conforms to the usual 'ECM Sound', but for once this opulent and spacious approach seems redundant. Both players, and Lonquich in particular, are more than capable of creating all the atmosphere the music needs without resonance being added for that purpose. And the reverb does occasionally sound very artificial, such as in the quiet upper register music from the piano at the start of the Fantasie, and on the rare occasions when the violin is heard alone. The lasting impression you go away from this disc with is of the distinctiveness of Carolin Widmann's playing. Whatever the resonance issues in the engineering, the violin sound is impressively clear and immediate throughout. This allows the listener to hear the details of her bowing and articulation. She makes a very visceral sound, very earthy and definite. I'm not sure that Schubert is the right composer for her (or for any violinist) but she makes sure that every drop of musical potential is exploited in the solo lines. She and Lonquich make an excellent team, partly I think because both have strong musical personalities, which both balance and complement each other. Given the faith with which ECM stick with their artists, we should expect some more discs from this duo in the years ahead. If they can persuade the engineers to give them a slightly drier acoustic, then the results are likely to be very impressive indeed.